Bring the s’mores indoors with this S’mores Icebox Cake to feed a crowd. With layers of graham crackers, marshmallow whipped cream, and chocolate ganache I guarantee everyone will be clamoring for s’more! In a small saucepan warm the heavy cream until it comes to a simmer. Pour the cream over the chocolate and let sit for a few minutes, then stir until melted and smooth. Place in refrigerator while preparing remaining ingredients. In a large bowl, combine the whipped topping, marshmallow fluff and marshmallows. Spread a thin layer on the bottom of a 13x9 pan. This is just to anchor the cracker layer. Top with a layer of graham crackers. Fill in any gaps with crackers cut to size. Top with 1/3 of the marshmallow mixture and spread in an even layer. Next, add half the chocolate ganache. Repeat layer of graham crackers, 1/3 marshmallow mixture and remaining ganache. Top with final layer of graham crackers and final 1/3 of marshmallow mixture. Garnish with graham cracker crumbs, chocolate chunks and marshmallows, if desired. 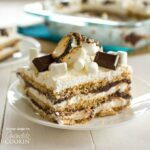 This recipe for S’mores Icebox Cake was printed from AmandasCookin.com - https://amandascookin.com/smores-icebox-cake/ and can only be printed for education or personal use.